A skeletal figure stands on a path next to the sea. The setting sun bathes the dark water in an orange glow. Two figures approach. The moment intensifies, swirls, swells until it is released as a sound of pure agony: The Scream. Edvard Munch’s “Der Schrei der Natur” (the Scream of Nature) is among the most famous paintings of the modern era. The now familiar image is interpreted as the ultimate representation of anxiety and mental anguish, a ‘touchstone for our troubled times’. I was walking along the road with two Friends / the Sun was setting – The Sky turned a bloody red / And I felt a whiff of Melancholy – I stood / Still, deathly tired – over the blue-black / Fjord and City hung Blood and Tongues of Fire / My Friends walked on – I remained behind / – shivering with Anxiety – I felt the great Scream in Nature – EM. That the image comes from a profound personal experience might account for its popularity. However pained the figure in the painting may be, many relate to it. Munch’s paintings show nature out of balance and mental breakdown in the face of modern experience. 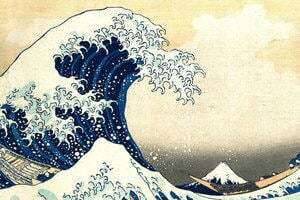 The emotions they convey are similar to those felt, for example, by many people scarred by the First, and then the Second World Wars. 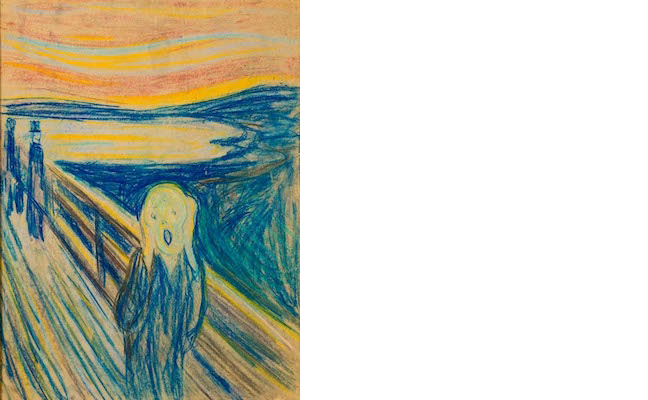 Philip Hook, senior director of Impressionist & Modern art for Sotheby’s London, has called the Scream “the image that launched a thousand therapists”, and that “it has come to symbolise a negative emotional reaction to just about everything”. In other words, anyone experiencing emotional anxiety may find fellowship in The Scream. 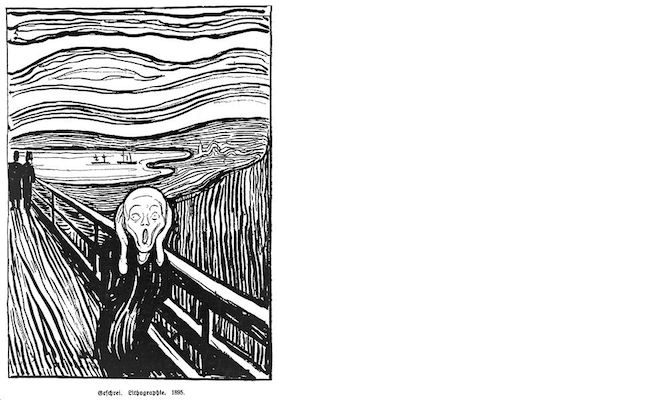 Perhaps the universal appeal of The Scream explains why it was stolen. 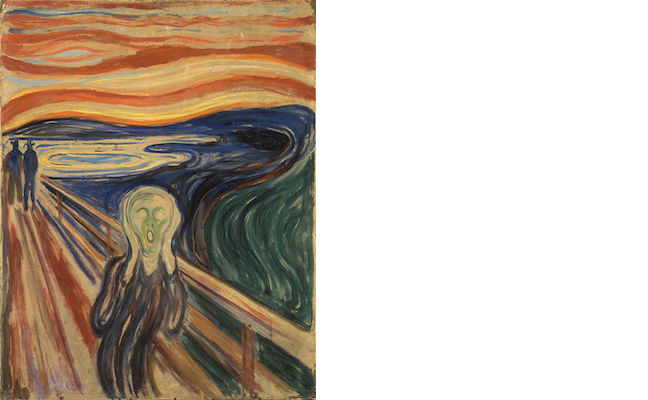 There are not one, but four versions of The Scream, painted by the Norwegian artist over the 17 year period from 1893 until 1910, as well as fewer than 50 lithograph prints made of it in 1895. 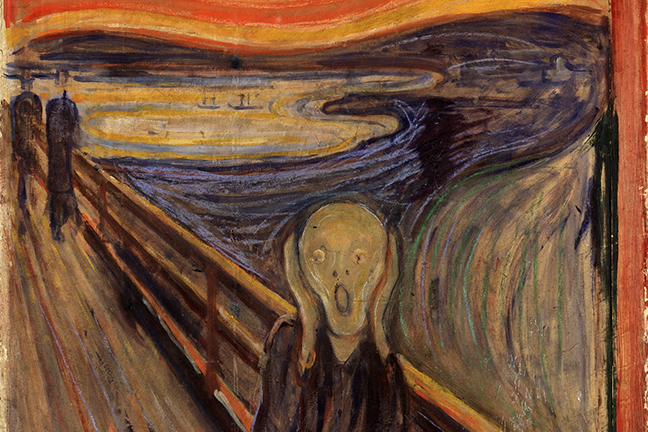 Each version of The Scream is unique. Munch clearly experimented to find the exact colours to represent his personal experience, yet all share the same essential composition and convey the same sense of personal pain. 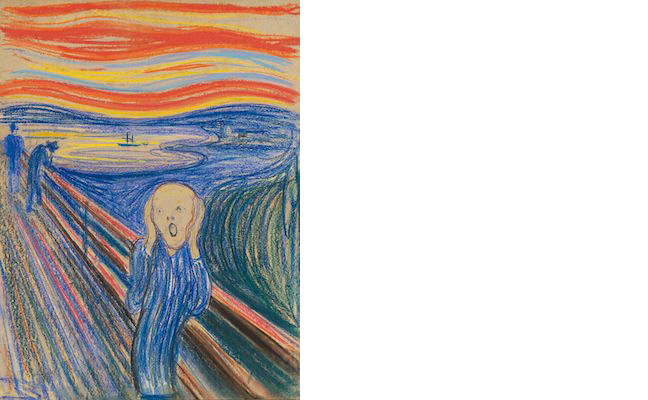 This version of The Scream may have served as Munch’s initial sketch for the more famous version he created later that year. This is by far the best-known version of The Scream. It was first exhibited in 1893 in a solo exhibition of Munch’s work in Berlin. It was purchased by Norwegian industrialist and artist Olaf Schou, who in turn donated the work to Norway’s National Museum in 1910. 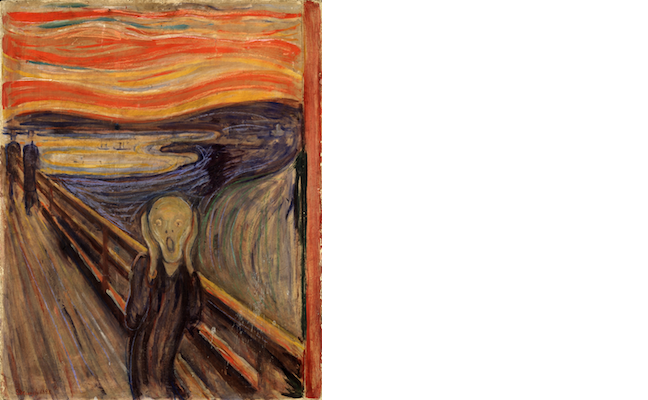 This version of the The Scream was in the collection of Norwegian businessman Thomas Fredrik Olsen in 1937. Olsen and Munch were acquaintances and the artist had painted Olsen’s wife. During WWII, just before the Nazi invasion of Norway, Olsen hid the painting in a hay barn to prevent it from falling into German hands. It remained in the Olsen family until 2012, when Olsen’s son Petter sold the work at Sotheby’s auction house for nearly $120 million USD. The buyer is reported to have been New York financier Leon Black. This is the version with Munch’s poem written on the frame. This version may have been created by Munch as a personal copy for him to keep after selling the more famous 1893 version. Around 30 to 45 impressions were made of this print. Some were on coloured paper, and others were hand coloured in watercolour. Copies are in a number of world museums. In the next two steps we will discuss two daring heists of The Scream.